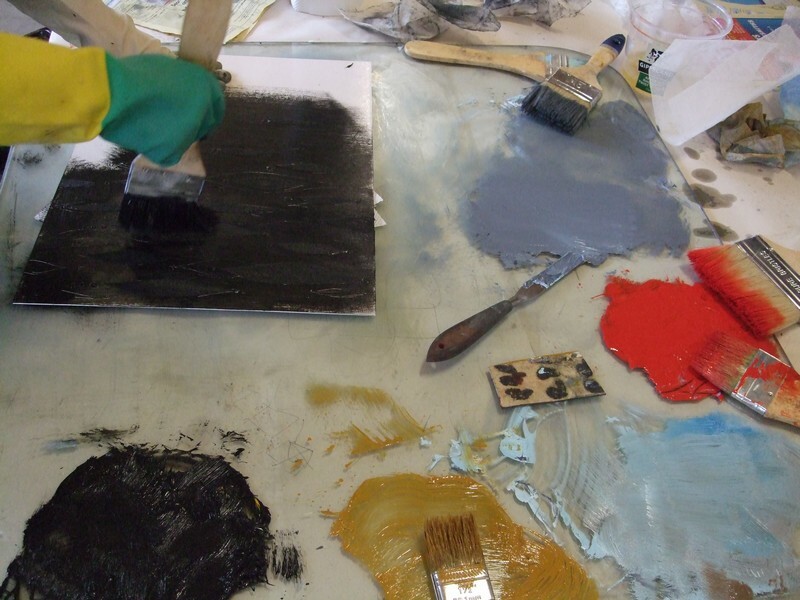 Castlemaine Press offers members access to a bright, well-equipped printmaking studio. Presses include a manageable 500 x 1000 mm direct-drive etching press and a geared etching press with a bed size of 1000 x 2000 mm for large work, both from local press-makers Merlarue. To use the studio, artists must become members and must be competent in printmaking. All members must complete a free orientation session and at least one supervised studio session working with an experienced studio member before they are eligible for access. Members also have the option of further sessions working with an experienced studio member if this is considered necessary (fee applies). You must book and pay before using the studio. Access is available at times when the space is not used for classes, including during weekends and term breaks. Castlemaine Press supplies presses, a drying rack, baths for etching solutions and for soaking paper, one large-scale roller, Perspex sheets for ink and rolling, rags and vegetable oil for cleaning, boards for pressing prints, and butchers’ paper. Studio users are responsible for bringing their own ink, palette knives, rollers, plates, printing paper, cutting and etching tools and ‘consumables’. Bank details will be provided by return email so that you can pay the hire fee. Please make your payment within 3 days of making your booking. Once payment is received, you will be given the key code to get into the studio. If you have an idea for a workshop, or course, or masterclass, or project you would like to run, we want to hear it! Proposals can be for something you run yourself or an activity coordinated by you and run by someone else. Please email a short proposal (one page maximum) with a brief CV and a description of what it is you want to run (and when), and how you will approach it. Proposals will be assessed by a panel and, once approved, the committee can work with you to plan and implement the project you’re proposing.